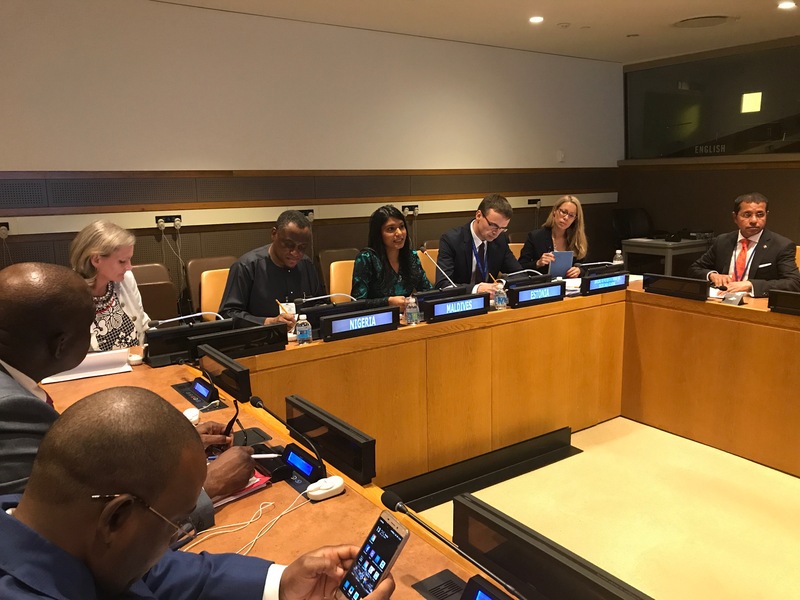 New York, 19 September 2017 - The office of the Special Representative of the Secretary-General on Violence against Children joined a ministerial level panel discussion on ending violence against children organized by the Governments of Maldives, Estonia and Nigeria during the high level segment of the United Nations General Assembly. “We commend the Governments of Maldives, Estonia and Nigeria for recognizing violence against children as a priority in their policy agenda and for hosting this important meeting during the high-level week of the General Assembly,” said the representative of the SRSG office at the event. The meeting provided an important platform to share lessons from the process of implementation of national policies and programs to enhance the protection of children from violence. The Minister of Gender and Family of the Maldives presented the recently adopted plan of action on violence against children. To support its development and implementation, a child protection data base has also been established to monitor and make public on a monthly basis, information about reported incidents of violence against children. The Minister of Foreign Affairs of Estonia presented the new child protection act with a plan for periodic evaluation of its enforcement and highlighted the valuable experience of promoting children’s house, which provides in one place all relevant cross-sectorial services to assist child victims of violence. In his remarks, the Minister of Defence of Nigeria highlighted the importance of data collection to protect children from violence, recalling the landmark 2015 national survey on violence against children and the policy agenda identifying crucial policy actions to address the major concerns the survey had exposed. A Year of Action to End Violence against Children had been launched on the same occasion by the President of Nigeria, and since then significant state level surveys and campaigns have been promoted in the country. The SRSG-VAC representative highlighted the importance of building on valuable national experiences such as these to safeguard children’s right to freedom from violence and accelerate progress in the implementation of the 2030 Sustainable Development Agenda, in particular SDG target 16.2 to end violence against children by 2030.